Who does not want eternal youth? Writers have written about it, poets have dreamt it, and filmmakers have given this fantasy a visual vent. However, the truth remains that one day, our skin will part with its natural vigor, and thus will commence the inevitable process of sagging. Thanks to our individual genetic pool, uncurbed smoking and drinking, the damaging effect of ultraviolet rays, quick weight loss, poor dietary habits, and the use of harsh chemicals, the skin gradually starts losing collagen and elastin (proteins found in the connective tissues of the face) responsible for the shape, strength and tightness of our skin. While natural processes have a way of catching up, these are some effective home-remedies that can help us their onset and maintain the bloom of our skin a little bit longer. Egg whites are packed with protein and hydro lipids that induce repair and regeneration of the skin tissues. They also contain riboflavin (Vitamin B-2) that combats hydro peroxides by activating enzymes. Hydro peroxides are a harmful group of free radicals producing chemicals that damage skin cells and accelerate aging. The magnesium in egg whites also helps slow down the process of aging. The membrane of eggshells is the perfect component for different anti-aging creams as it provides a chick embryo with the nutrients to nourish the skin and trigger growth of tissues. A simple mask of only egg whites will surely benefit you. However, it is advisable to mix it up with other ingredients for added nutritional benefit. Blend 1 avocado into a creamy paste and pour into a bowl. Mix 2 egg whites with the avocado paste. Add a few drops of chamomile oil. Apply on the face and leave on for 10 minutes. Wash your face with cold water and pat yourself dry. Avocado is not only an excellent source of Vitamins A, B, C, E and K, but it also contains iron, phosphorous, copper, potassium and magnesium. The magnesium in the avocado combines with the magnesium in the egg white to double the anti-aging effect. Moreover, avocado has terrific hydrating properties. The penetrable quality of the egg white ensures the nutrients from the avocado settle down deep into pores and cleanse them thoroughly. Raw milk is especially effective in long-term skin tightening as it contains calcium, selenium, Vitamin D and Alpha Hydroxy acids (AHA). The Alpha Hydroxy acids allow the dead cells of the epidermis to slough off by separating them from each other, and making room for new cells to grow. Furthermore, they also aid the production of collagen and elastin, thereby fighting wrinkles and maintaining elasticity of the skin. In a 2015 study published in Journal of Clinical, Cosmetic and Investigational Dermatology, 52 participants followed an anti-aging skin-care system consisting of cleansers, creams and moisturizers high in AHA content for 21 days. After the study, researchers noted a significant improve in the texture of facial skin, improved skin elasticity and reduced wrinkles. The Vitamin D in milk also stimulates production of collagen and elastin. The calcium and selenium in the milk too helps in the production of these proteins and battles free radicals that damage cells and obstruct growth of tissues. Wash your face with warm water (to open up pores). Mix 1 tablespoon of oatmeal in a bowlful of raw milk. Apply the mixture on your face in an upward, circular motion. Wash off with cold water (to close the pores). Oatmeal is a good exfoliating agent. The milk will carry the oatmeal to the pores, which will then eliminate excess oil, sebum and dirt. Be it to aid digestion, improve the texture of facial skin, or as a hair conditioner, papaya never disappoints! Papaya contains papain – an excellent agent for breaking down dead cells and allowing the growth of new ones. It also stimulates the growth of essential amino acids and peptides, and opens up clogged pores. Furthermore, papain, along with Vitamins C and E, stimulates the growth of collagen and elastin, and fight cell-harming free radicals. The anti-bacterial and anti-inflammatory properties of papain also make papaya a favorite of those suffering from skin sagging while also battling acne and scarring that further makes the skin look lifeless and dull. Mash 1 ripe and de-seeded papaya in a bowl. Mix ¼ cup of rice flour to the mashed papaya. Leave it on to dry for 20 minutes. Rinse your face with lukewarm water and pat the skin dry. Follow the remedy twice every week for effective results. The rice flower is an excellent anti-clogging and exfoliating agent. It will cleanse and allow smooth passage for the nutritious papaya into the pores. Alternatively, you can simply blend a ripe and seeded banana, and apply the paste on your face for 10 to 15 minutes thrice each week. Olive Oil is a rich source of anti-oxidants like Vitamin A and E. Polyphenols found in extra virgin olive oil tend to activate a group of anti-aging genes that protect the skin from free radicals and delay the aging process. Moreover, olive oil helps in moisturizing the dull skin, repairing skin tissues and stimulating the production of new cells. The mono-saturated fats in olive oil soothe and dull the appearance of the already existing wrinkles. Green apple is rich in malic acid, vitamins and anti-oxidants that help remove dead cells, fight free radicals, and promote the growth of new skin tissues. Honey also acts as an exfoliating agent and hydrator. Mix 1 grated apple, 1 tablespoon of extra virgin olive oil and 2 tablespoons of organic honey. Apply this mixture to your face and leave on for 5-10 minutes. Alternatively, you could simply massage warm olive oil on your face 3 to 4 times every day. Hippocrates, the father of Medicine, swore by vinegar. So who are we lesser mortals to question it? For starters, apple cider vinegar (ACV) is obtained from a two-stage process of fermentation. Foods that are fermented are high in enzymes, which are responsible for growth and repair. It is also rich in antioxidants that ward off cell-destroying free radicals and aid the growth of new cells. According to a 2014 study published in the Journal of Membrane Biology, a group of 10 mice divided into 4 groups consumed a high cholesterol diet for 28 days. Results showed that two groups that were simultaneously fed ACV reported increased levels of vitamins and antioxidant enzymes. Moreover, the vitamins B1, B2, B6 and C along with the acid found in apple cider vinegar propel cellular reproduction. Dilute 1 part of organic apple cider vinegar in 2 parts of water. Dab a cotton ball in the solution and apply it on your face. Allow it to dry on its own (for 15 minutes). Finish with applying a moisturizer. Follow every day for 2 weeks to observe amazing results. Cinnamon is a rich source of polyphenols that are responsible for activating a class of genes in our body that delay the anti-aging process by suppressing age-associated cellular destruction. Cinnamon is also a rich source of antioxidants that combat cell-damaging free radicals and promote the growth of new skin cells. A study published in the Indian Journal of Experimental Biology showed that when rats on a high-fat diet were simultaneously fed cinnamon, the antioxidant enzyme activity significantly increased in their systems. Take 2 teaspoons of cinnamon in a bowl. Add 2 tablespoons of honey and 1 teaspoon of nutmeg to cinnamon. Mix and apply the paste on your face for 30 minutes. Rinse off using water and pat your face dry. 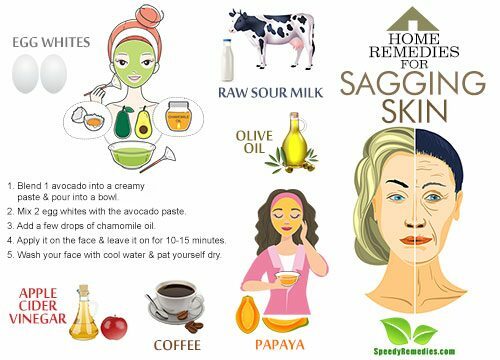 Use this face mask 2 to 3 times a week. Apart from being everyone’s favorite beverage, coffee helps tighten skin by draining excess moisture from the face. Caffeine contains antioxidants that fight free radicals and promote cell and tissue growth. It also exfoliates the skin and removes dead cells. Mix 2 to 3 cups of grated carrot with 2 to 3 spoons of red clay or green clay (Carrot contains beta-carotene (antioxidant) which, along with clay, removes dead cells). Add 2 cups of ground coffee along with 1 teaspoon of water to the mixture. Mix thoroughly and apply the mixture gently on your face. Massage in upward circular motion for 2 minutes and leave it on 10 to 15 minutes. You can use this face mask 2 to 3 times each week. Alternatively, you can use ground-coffee leftovers as a facial scrub. After drinking a cup, simply scoop up the leftover coffee, rub your face with it in an upward circular motion for 10 minutes, and wash off. Use this scrub twice a week. Journal of Membrane Biology: Apple cider vinegar modulates serum lipid profile, erythrocyte, kidney, and liver membrane oxidative stress in ovariectomized mice fed high cholesterol.